This is a Big Concho & Crescent western show horse bit -- made WITHOUT SILVER inlay -- only the concho is made of GERMAN SILVER. 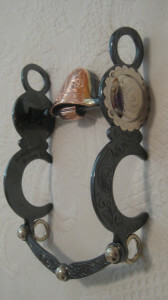 The shanks are made of steel, are hand engraved and have a Black finish. The shank is 8" long. This particular one has MP-02 (Salinas MP) which is a lhigh port mouthpiece with copper cricket & hood and no tongue relief). The mouthpiece is sweet iron (which horses love) and bit ends with a slobber bar.